Growing up in a Polish family, we had sauerkraut often with many meals. My Mom's sauerkraut was the best and I would make a sandwich with just sauerkraut. When I saw this "burger" with sauerkraut, I had to give it a try. I'm calling this recipe German Meat Pies since it was a German/Russian family that came up with this recipe. Diner's, Drive-ins and Dives featured this recipe on one of the episodes and it was called a Lauer-Kraut Burger. 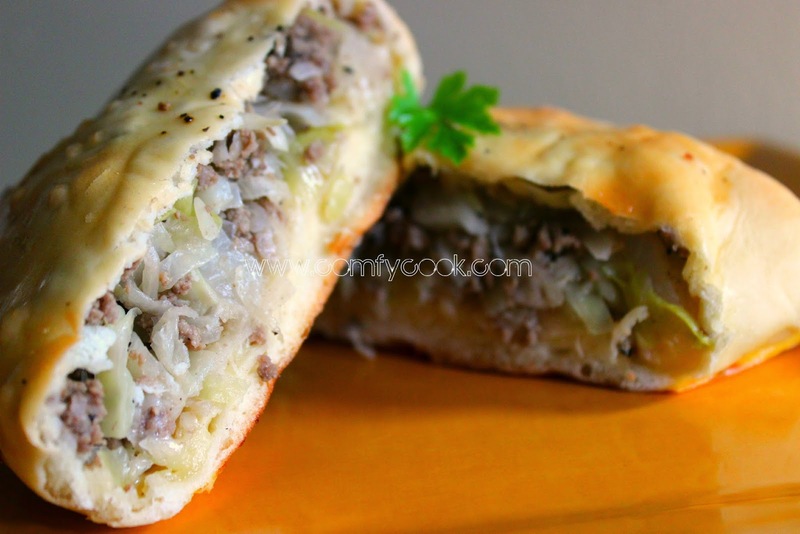 Ground beef, onions, cabbage and sauerkraut was the filling for these individual pies. The dough in this recipe is very easy to work with and the results were light and tender. It tastes similar to a soft pretzel dough. For the burger filling: Begin by browning the ground chuck in a large skillet over medium heat, crumbling the meat pretty finely as it browns. Once the chuck is browned, add the chopped onions and 1 teaspoon pepper. Cook the onion down a little, 3 to 5 minutes. Add the chopped cabbage, sour kraut, salt and the remaining1 teaspoon pepper. Let the mixture cook 10 to 15 minutes, depending on how done you like the cabbage. Strain and let cool. For the dough: Put the yeast and sugar in a 2cup measuring cup and add warm water to the 1/2 cup mark. Stir together and let set to activate. Put the powdered milk in another 1 cup measuring cup and add water to the 1 cup mark. Stir together. In large mixing bowl, add the flour, salt and shortening. Once the yeast has risen to twice its original size, cut the shortening into the flour by hand. Next, make a well in the flour and add the eggs. Then add the yeast mixture and the powdered milk mixture to the flour. Work together until it all comes away from the bowl (you may need a touch more flour or water). Oil the dough slightly on each side, cover and then let rise 10 minutes. Pinch and let rise another 15 minutes. To assemble the burgers: Put bench flour on the table and put the dough on the flour. Begin to roll the dough as close to a rectangle as you can, roughly 24 by 30 inches. Once the dough is rolled out, cut the dough into squares, roughly 6 by 6 inches. Take a square of dough and roll it out a little bigger, roughly 8 by 8 inches. Turn the re-rolled square over and add a full cup of filling mixture into the middle of the dough. Bring the opposite corners of the square together, and then bring the other 2 opposite corners together. You should have all 4 corners drawn together. Then pinch down the 4 seams of the dough. Once you pinch all the seams, push down slightly on the kraut burger. This will release extra air and help you find any place you missed sealing the kraut burger. Turn the sealed pocket over and place on a parchment-lined baking sheet. Repeat with the remaining ingredients. Sprinkle with salt and pepper if desired. Bake at 375 Degrees F. for 15 to 20 minutes. This recipe makes 12 big pies! Can i replace shortening with veggie oil ? You might try it Simi - the shortening makes it similar to a biscuit dough. The dough was the best!! Bierocks is what they are known as in our German/Russian ancestry and what we called them in Oklahoma and here in Northwest Texas (since there are so many of us from Oklahoma)...but WHATEVER you want to call them...they are just GOOD! This was a hit with my whole (big) family! Thanks so much for sharing! !